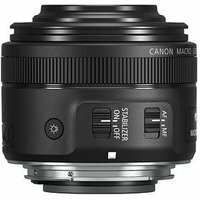 Canons EF-S 35mm f2.8 Macro IS STM lens is ideal for taking pictures in close-quarters, street photography and portraiture work. With a minimum focus distance of 0.13m, and a working distance of 3cm, this lens can reproduce life-size magnifications in incredible detail. In-built Optical Image Stabilisation means shooting handheld is smoother than ever, especially when capturing video.